More than half of the natural vegetation in Mexico is managed collectively within common property systems. The appropriation and continuity of government programs related to the conservation of land that is communally used is proposed to depend on the level of organization of the communities and the interaction between the local and governmental institutions, as well as the benefits derived from conservation projects. Patterns of what drives the conservation of common natural resources were analyzed in order to propose improvements to conservation policy. Changes in primary and secondary vegetation cover in common and private properties were identified by performing a historical spatial analysis. Questionnaires were used to survey 32 populations of seven states of the Mexican Republic to determine the conservation status of common property resources, as well as the ability of the community to continue conservation activities initially undertaken by government programs. 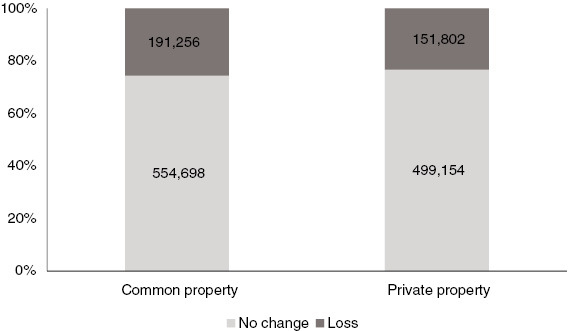 Some 53% of the primary and secondary vegetation in Mexico is found in common property areas, but the change from primary and secondary vegetation to other uses is the same for common and private property. Communities with a high level of conservation of communal areas and with the ability to continue conservation projects were those that had dedicated the areas to recreation and conservation, had stronger community organization and were less marginalized. A recognition of the heterogeneity of the socioeconomic and cultural context of communities with common property is necessary to design governmental conservation programs that achieve long-term conservation. To meet the needs of a region that is both degraded and marginalized, the creation of synergies between programs that combat poverty and programs that promote conservation is needed. In addition, the continuation of payments with public funds for work that preserves or rehabilitates natural areas is needed, thereby acknowledging the environmental services that these areas generate. More than half of the vegetation in Mexico is managed collectively within systems of common property (Johnson and Nelson 2004; Boege 2008; INEGI 2008a). The appropriation and continuity of government programs related to the conservation of natural vegetation (natural species composition reached after a long period without large-scale disturbance, see Sprugel 1991) on communal lands depend largely on the organizational level of communities and the interaction between local and governmental institutions, as well as the benefits derived from the conservation projects (Soule et al. 2000; Agrawal 2001, 2007). When these programs fail, they may generate not only environmental degradation but also distrust of the community regarding the outcomes of collective effort and a waste of the resources invested by governments and other institutions. In this context, the analysis of what drives the conservation of natural environments (living and non-living things occurring naturally and relatively undisturbed, see Johnson et al. 1997) on common property is fundamental for promoting projects that are better directed to its preservation. Since the time of Aristotle, the idea of poorly cared for Commons has existed. This was formally developed by Hardin in 1968 in his essay entitled “The Tragedy of the Commons,” which argues that in the use of common resources, each individual will try to maximize his or her gain. Under this reasoning, beginning in the 1980s, a trend toward the privatization of all natural and non-natural resources began, with the underlying idea that private ownership would lead to better care. However, other studies have shown cases of sustainable resource use for common property as well (Gibbs and Bromley 1989; Agrawal 1994; McKean 2000). Elinor Ostrom played a lead role in systematizing these cases, arguing that sustainability can be achieved if the society is organized under effective rules and standards of resource management (Ostrom 1990, 1992). On the other hand, there is the idea that collective work for any goal is motivated not only by obtaining a common good but also by selective private benefits, frequently associated with a material benefit (Olson 1965). However, the selective private benefits valued by individual humans may vary widely, and in addition to material incentives, solidarity, prestige and “moral duty” (Clark and Wilson 1961; Reisman 1990; Wilson 1995; Herreros-Vasquez 2003) exist as well. Although some authors claim that economic incentives are imperative for conservation of natural vegetation (Soule et al. 2000; Wunder 2000), others argue that social institutions are successful at managing their resources under the scheme of the eight principles proposed by Ostrom (1990) (Cox et al. 2010). Some of these principles are related to social motivations and are concerned with the organization of communities and the social recognition of people within the group (for example, sanctions imposed by the community on a person who has violated an internal standard or who ceases to participate in collective work). This social motivation may be even more important as a form of regulation than economic incentives and affects the conservation of the natural environment (Agrawal and Gibson 1999; Butler 2003). The disposition of a community to perform conservation projects can be linked to the level of degradation of the natural environment, among other factors (Fraser 2004). If the environment is highly disturbed, its recovery can be a difficult task that requires financial support. In these cases, government incentives in the form of daily wages, a single cash payment or an indirect transfer serve to stimulate short-term gain in order to undertake long-term conservation projects. In contrast, if the environment is conserved, so that its ecosystem functions are maintained (e.g. soils free of erosion, presence of natural vegetation, etc.) and the effort to maintain it in good condition is minimal, social incentives such as those already mentioned could be sufficient to generate behaviors that are compatible with preservation of the natural environment (Butler 2003). In Mexico, the existence of common property is very frequent and has been so since pre-Hispanic times. Currently, these types of property are known generically as agrarian centers or specifically as either Communal Properties or “Ejidos”. Common property in Mexico is made up of territories where the population designates one area for collective natural resource management, or common property resource (CPR) (Cleaver 2000) and another area for housing and community infrastructure, such as schools and hospitals, as well as for individual production activities. All decisions related to natural resource exploitation of the common area are discussed by an assembly comprising the authorities that the town itself elects. Agreements are made during these meetings regarding the collective work or tasks to be carried out in the common use areas (DOF 2012). In 1991, there was a change in article 27 of the Mexican Constitution that permitted the agrarian centers to modify their land tenure from common to private property. However, according to the National Agrarian Registry (NAR) and the Public Property and Commerce Registry, by 2007, few changes had been recorded (Vargas, Ochoa, and Danemann 2008). According to Boege (2008), it is estimated that 33% of primary vegetation and 44% of secondary vegetation in Mexico are in the territories of indigenous communities, where the area managed in communal property is typically higher than the area occupied by private property; however, trends for the entire country are unknown. In this sense, it is important to determine the percentages of vegetation for each type of tenure and to analyze the dynamics of change to observe whether common property or private property has different patterns of conservation. Through spatial analysis, the first two objectives of this research to test these phenomena were as follows: 1) to estimate the percentage of primary and secondary vegetation for common and private property in the entire country between 2007 and 2010 and 2) to analyze the changes that occurred between 1976 and 2008 in the primary and secondary vegetation cover of the country for common and private property. On the other hand, given that much of Mexico’s natural resources are managed by common property (Johnson and Nelson 2004; Boege 2008; INEGI 2008a) and the adoption of conservation strategies largely depends on the relationship established by the institutions that govern the different levels of social organization (Bray et al. 2003; Johnson and Nelson 2004; Bray, Antinori, and Torres-Rojo 2006), we choose to work with this type of tenure to understand what encourages communities to conserve their natural resources; what relationship is established between social institutions for the implementation of conservation policies; and what factors become successful in their application to propose improvements in this process. To answer these questions, the second two specific objectives included the implementation of questionnaires in communities only in the central region of Mexico 3) to examine whether there is any pattern that characterizes agrarian centers that better preserved their common property resources (CPRs); and 4) to explore the relevant variables that enable a community to continue the conservation activities started through government programs. The percentage of primary and secondary vegetation present in private and communal property throughout the entire country (Objective 1) was estimated by comparing the “Land Use and Vegetation” maps at a scale of 1:250,000, Series IV (2007–2010) (INEGI 2008b), and the polygon map of agrarian centers developed by the National Agrarian Registry (NAR) (this database records the citizen properties (not state properties) and the type of tenure) (INEGI 2007). The relationship between the surface with primary and secondary vegetation that changed to anthropic use and land tenure (Objective 2) was analyzed using the “processes of change of vegetation and land use, 1976–2008” map, at a scale of 1:250,000 (Pérez et al. 2011), and the National Agrarian Registry (NAR). In addition, the NAR was compared with the map of Natural Protected Areas (CONANP 2008) to determine the percentage of communal and private property located within and outside Natural Protected Areas. The analyses were performed using the ArcGIS 9.0 software. The state of conservation of the common property resources of the agrarian centers and the populations’ abilities to continue conservation projects (Objectives 3 and 4) were considered the response variables to be analyzed. The information was obtained by designing questionnaires that were given to 32 agrarian centers located in seven states of the central Mexican Republic: Mexico, Guerrero, Morelos, Oaxaca, Puebla, Querétaro and Tlaxcala (Figure 1 and Appendix 1). The intention of the study was to understand the processes occurring in a wide region of central Mexico. For this reason, we contacted researchers who have worked in these states and asked them to help us conduct questionnaires in their study sites where they had prior contact with local authorities. Although the towns were not randomly selected, this method allowed us to establish faster contact with the communities and to take advantage of prior knowledge about these places that the interviewers had. Four questionnaires were distributed in each agrarian center, so the total sample was 128 questionnaires. Interview questions were related to the biophysical, sociodemographic, cultural and economic aspects of the community, as well as aimed at describing the ease or difficulty with which the government programs addressed the implementation and dissemination of soil conservation, protection of flora and fauna, reforestation and pest control. To avoid anchoring and attitude (Liu and Sibley 2006) in the subjective answers, we met with the people who conducted the interviews to explain how they should pose the questions and included an explanation of how to administer the questionnaire. Location of the 32 agrarian centers where the interviews were conducted. The four questionnaires per agrarian center contained different questions and were aimed at four different key players within the community: the Commissioner of the agrarian center, who is the authority designated by the community to govern everything related to common property resources; the person authorized to manage the financial resources obtained for conservation projects; a citizen who has participated in conservation project labor; and a citizen or authority who is very knowledgeable of the biophysical environment of the agrarian center. The people who apply questionnaires (interviewers) were technicians and students who had previously worked with the community in projects related to the management of natural resources and who knew the people to approach for answers to the various questions. Each interviewer explained the purpose of this research and obtained verbal permission from local authorities and interviewees to respond to the questionnaires. To include agrarian centers that had CPRs that were conserved and not conserved and with the capacity and the lack of capacity to continue conservation work, the selection of the sites was based on the interviewers’ knowledge (based on their previous experience working in the agrarian center) of both the conservation status of the CPRs and the residents’ ability to continue conservation work. According to the perception of the interviewer, 14 of the 32 agrarian centers interviewed were well conserved, and 18 showed signs of degradation, meanwhile, 14 agrarian centers had the capacity to continue conservation work and 18 agrarian centers did not have this ability. To verify and measure the subjectivity of the interviewers’ determination of the conservation status of the different communities and their ability to continue conservation work, questions that might support or refute the perception of the interviewers were incorporated into the questionnaires to be answered by the people being interviewed. Data for the estimation of conservation level were obtained from the questionnaire given to the person who knew the biophysical environment of the agrarian center. This questionnaire was completed during a field trip that was undertaken with the interviewee. An estimation of the “level of conservation” indicator of each agrarian center was performed using the answers to questions to five variables related with environmental conservation: the type of vegetation cover, the density of vegetation cover, the degree of soil displacement, the evidence of soil erosion and soil fertility. The people who were interviewed had to select their answer from categories assigned to these five variables (see Table 1). The answers to these five variables were analyzed using Principal Components Analysis (PCA) to create the indicator (Gotelli and Ellinson 2013), which differentiated each agrarian center at a level of low, medium or high conservation. Variables of the “level of conservation” indicator. §This is a measure of the level of degradation to plant cover. Typical refers to little or no change, scarce refers to a medium change, and absent refers to a major change. To check the certainty of the indicator to determine the “level of conservation” of the agrarian centers, the degree of correlation between the PCA scores obtained and the location of the agrarian centers (inside or outside a Natural Protected Area (NPA)) was analyzed. The correlation was significant at a level of 0.01; in other words, 99% of the CPRs of agrarian centers that were located in an NPA showed a high level of conservation on this evaluation. The ability to continue projects was evaluated from the questionnaires answered by the Commissioner of the agrarian center, from the manager in charge of the conservation projects, and from a civil participant in the projects. Their responses were the variables used to estimate the indicator “ability to continue conservation projects”, that according with our criterion, described the perception of the authorities and civilian population regarding the possibility of continuing conservation projects (e.g. soil conservation, protection of flora and fauna, reforestation and pest control) even without receiving financial support from the state or federal government; and the individual and collective losses incurred while carrying out the conservation project proposed by the government (Table 2). The responses were converted to a binomial numeric variables as shown in Table 2 (e.g. Yes or No/None or Several) and analyzed using Principal Component Analysis (PCA). The certainty of the indicator in classifying the agrarian centers according to the “ability to continue conservation projects” was evaluated by the correlation analysis between the information predicted by the people who applied the questionnaire on the capacity of agrarian centers to continue or not the conservation projects with the PCA scores obtained from the responses of the people interviewed about their ability to continue conservation projects for each agrarian center. Matches occurred in 96% of the agrarian centers interviewed. To reduce strategic answers and anchoring, the same questions were asked to the four interviewed people per community and were then compared. Similarly, objective questions that could corroborate the answers on perception were included (e.g. objective questions about the existence of collective voluntary workdays for the community were included and compared with the response regarding the possibility of continuing conservation projects even without receiving financial support from the government). Finally, we had a meeting with the interviewers to obtain their assessment of the accuracy of the answers and to decide whether they must be excluded from the analysis or replaced with a new interview. The analysis of the relationship between the two indicators (level of conservation and ability to continue conservation projects) and the answers obtained from the four questionnaires related to the biophysical, social, and economic variables of each agrarian center was performed out using discriminant analysis (Ritchey 2008). This analysis identified the variables that significantly separate the groups of each discriminant function. In one case, the discriminant function was the “level of conservation” and, in the other, the “ability to continue conservation projects”. The variables for the discriminant analysis were the answers to the questionnaire with regard to physical, social, and economic characteristics. We used 19 variables for this analysis (see Appendix 2), and 57 others were excluded because variance was less than 0.1, interpretation amounted to something qualitative and thus was not quantifiable or the questions had not been answered by all of the agrarian centers. The comparison between the land use and vegetation maps (INEGI 2008b) with common property of the National Agrarian Registry (NAR) (INEGI 2007) showed that 53% of all types of primary and secondary vegetation in Mexico are located in common property areas. In addition, overlapping the polygons of the Natural Protected Areas (NPA) (CONANP 2008) with the NAR map revealed that 63% of the NPAs are located in territories managed by the agrarian centers. The change in primary and secondary vegetation to other uses (livestock, agricultural, without vegetation and others) between 1976 and 2008 (Pérez et al. 2011) is nearly the same for common and private property (INEGI 2007). During this period, 74% (554,698 km2) of all types of primary and secondary vegetation remained unchanged on common property, and 26% (191,256 km2) was lost, whereas private property lost 23% (151,802 km2) and maintained 77% (499,154 km2) (Figure 2). The process of secondary succession, i.e. the conversion from primary to secondary vegetation, was also quite similar among these properties: 18% (135,713 km2) in common property and 20% (128,209 km2) in private. Percentage of change at the national level in primary and secondary vegetation on common and private property between 1976 and 2008. The transformed surface shown for each case is in km2. The “level of conservation” indicator of the CPRs divided the agrarian centers of this study into two groups: 52% with a high level of conservation and 48% with a medium and low level of conservation. The best-conserved CPRs in the agrarian centers were those that the respondents perceived as having the greatest amount of natural vegetation cover and typical densities as well as less evidence of erosion and loss of soil fertility (Table 1). Of the analyzed variables that were related to biophysical, social and economic aspects, the following had averages that were significantly different between agrarian centers with a high level of CPR conservation and those with a low or medium CPR conservation level: a) annual average precipitation (p=0.04), b) activities conducted in the CPR (p=0.08), c) collective conservation workdays performed in the agrarian centers (p=0.01), d) level of marginalization (p=0.01) and e) distance to a town with more than 15,000 inhabitants (p=0.03) (Table 3). The communities with a high level of CPR conservation were those with greater precipitation (x̄=904 mm in the CPR with a high level of conservation vs. x̄=688 mm in the CPR with a medium or low level); those that incorporate conservation and recreational uses into the CPR and that have agricultural, livestock and extractive activities that occur in the least conserved CPRs and those that undertake significantly more collective conservation workdays, have a low marginalization of their population and are closer to settlements of more than 15,000 inhabitants (less than 20 min and a travel cost of 6 cents). Biophysical, social and economic variables that had a significant relationship with the “level of conservation” indicator. §The level of marginalization was calculated from the index of marginalization published in government statistics (SEGOB 2010). The influence of a social motivation related to access rules for the resources of the CPR was discarded because it had a very small variance. Almost all communities claimed to have rules of this type; however, the rules may be aimed at minimizing conflicts among villagers and not at promoting a sustainable use of resources. In this context, the present study lacked sufficient information to distinguish the effect of regulation types on the conservation of the CPRs. Moreover, the existence of sanctions for breaking rules (p=0.53), as well as the importance of the resources obtained from the CPR (p=0.86), did not result in any variables that could be used to discriminate between agrarian centers with high and low levels of conservation. In the sample of agrarian centers analyzed, 53% corresponded to communities that have the ability to continue (follow-up) conservation projects and 47% to those that do not. Those interviewees who felt that their communities had lost time or money in conservation activities perceived that the population would be unlikely to carry out conservation activities without some type of support. The results of the discriminant analysis showed significant differences between these two groups in the following variables: a) the number of Ejido or communal members per agrarian center (p=0.01), b) the size of the CPR of each community (p=0.02), c) the collective conservation workdays performed in the agrarian centers (p=0.03) and d) the percentage of the Ejido members or communal land members who participate in meetings (p=0.03) (Table 4). The communities best able to continue conservation projects without further government subsidies were those that had fewer Ejido members or communal land members (x̄=199 Ejido members in communities with follow-up vs. x̄=373 Ejido ­members in communities without follow-up), that manage less extensive CPRs (x̄=582 ha in communities with follow-up vs. x̄=1705 ha in communities without follow-up), that perform significantly more collective conservation workdays and where more than 80% of the community members are involved in local meetings. Biophysical, social and economic variables that had a significant relationship with the “ability to continue conservation projects” indicator. Even though the level of marginalization was higher in those communities less able to continue conservation projects, this variable was not significant (p=0.14) to discriminate between the two groups. The importance of the CPR resources, comprising the frequency of resource use and the proportion of income that this use represented, was not relevant for motivating the continuity of conservation projects (p=0.74). First, we discuss the changes in vegetation cover and their relationship with common and private property. Then, the following sections describe the variables that were significant for each indicator around patterns that are reported in the literature. The results of the vegetation cover-change analysis over the last 30 years in Mexico showed that the trends of change in the country have not been very different between territories under common or private property. We found that the percentage of vegetation loss, as well as conversion from primary to secondary forests, was not very different between the two property types. This suggests that there have been similar processes in the conservation of natural resources independent of the type of land ownership. According to the literature, community governance of natural goods is not necessarily linked to processes of successful conservation (Oldekop et al. 2010), but no direct relation was found between environmental degradation and the management of resources in communal property either (Agrawal and Yadama 1997; Somanathan et al. 2005; Hayes 2006). Thus, neither type of property was expected to be better conserved. It is argued that when a society has successful community government rules, the success of conservation programs is often influenced (Oldekop et al. 2010). Additionally, when communities are in natural protected areas, conservation success depends on the capacity of dialogue between federal and local actors (Johnson and Nelson 2004). Conservation programs that the government and other civil organizations promote in the agrarian centers are mainly related to soil conservation and the recovery of vegetation through activities such as reforestation, pest control and the construction of fire breaks. In general, these projects tend to be accepted when financial support is provided. On completion of such projects, a certain level of maintenance is required to continue or achieve the project objective, but in the majority of programs, this maintenance is no longer associated with continued subsidies. This leads the communities, in many cases, to abandon the work they had undertaken (Author Obs. Pers.). While abandonment of environmental programs occurs frequently, when we analyze the results of this research, we find that the CPRs of agrarian centers that performed collective conservation workdays and had greater meeting participation showed less evidence of degradation. In these cases, conservation work continued even without subsidies. It has been reported that the conservation and successful management of natural resources on communal property is mainly due to the organization and strength of local institutions (Agrawal 2007; Poteete and Ostrom 2008; Cox et al. 2010). In this study, the organizational capacity of communities was an important contributing factor in deciding whether to continue conservation projects initiated with external support. On the other hand, the best-conserved agrarian centers were those where the CPRs, in addition to the agricultural, livestock and extractive production uses, were also used for recreation and conservation. According to the information obtained in the interviews, sustainable tourism or recreational activities, as well as management of areas known as Wildlife Management Units (WMU: land registered with the government for carrying out the sustainable use of resources, in some cases for commercial purposes) (Ortega et al 2016), existed in the conservation areas. In general, these activities are small businesses that produce immediate gains for the residents and might encourage them to conserve these areas (Soule et al. 2000; Wunder 2000). However, other motivators may exist for conserving ecosystems that could involve aesthetic reasons (Clark and Wilson 1961; Reisman 1990; Herreros-Vasquez 2003) or be because maintaining the ecosystems provides better resources for subsistence. Nevertheless, it would be necessary to conduct a more detailed study to confirm these reasons. The organizational capacity of communities is related to socioeconomic factors that heavily influence the level of conservation of natural resources in areas of community use (Agrawal 2007). High levels of marginalization can generate low participation in community projects due to the difficulty of working collectively for a cause whose remuneration is not immediate (Portes 1998; Putnam 2001; Arriagada et al. 2004; Gonzalez de la Rocha 2005). Our results agree with the literature and show that communities with a high degree of marginalization (SEGOB 2010) often carry out conservation work motivated mainly by funding received from conservation programs, and without this grant, the work undertaken does not continue. Paradoxically, conservation programs promoted by the government have mainly been applied to the most marginalized areas in the country, but simultaneously, government officials and technical staff from civil organizations assert that many of these programs fail because the communities breakdown in continuing them (Author Obs. Pers.). There is no doubt that the marginalized population requires priority attention to address poverty; however, we question whether this attention should be given through programs that by their very nature require an organized and participatory population that is capable of continuing with volunteers and without payment for previously initiated conservation projects. In light of this, conservation programs should be designed while taking into consideration the differences between communities with higher and lower levels of marginalization. If poverty levels are met, then it is likely that the organizational capacities of communities will be improved and that, therefore, conservation programs can be more successful. The agrarian centers with the greatest ability to continue conservation projects were those with fewer members and a smaller CPR. Good organization in a collective initiative requires leadership, which is an important condition, and not everyone has this ability. The interviews indicate that it is uncommon for members of the agrarian centers to accept the responsibility of being the agrarian center authority, for which the remuneration is symbolic. The responsibilities of this position have ceased to be interesting due to the decrease in the profitability of rural activities and the predominance of a mercantilist society. Depreciation of this work has led to such positions being represented by people who not only lack leadership in the community but also lack the interest or initiative to organize people around the activities that will improve the living conditions of the population. When there is no leadership, smaller groups and activities in smaller CPR are easier to organize. According to the responses obtained, 70% of the authorities interviewed that were enrolled in a conservation program indicated that the most difficult task was organizing the people. This coincides with reports by other authors who have indicated that small, more homogeneous, well-organized groups with strong institutions are better able to effectively regulate the management of their resources in communal areas and therefore maintain better conservation (Poteete and Ostrom 2004; Agrawal 2007; Poteete and Ostrom 2008; Oldekop et al. 2010; Poteete et al. 2010). The proximity of the agrarian centers to large populations of more than 15,000 inhabitants is related to better-conserved CPRs. Although this relation has been poorly evaluated (Agrawal 2007), some have found that the proximity to large populations increases the income level of the population, which means there is more to invest in conservation projects (Soule et al. 2000). The low marginalization indices in the better-conserved agrarian centers suggest that income level was higher among its inhabitants, which could come from access to jobs in the large population centers. On the other hand, the higher income level may have resulted in a society that depends less on the natural resources of their CPR and consume products obtained in local markets (Falk 2008). The reduction of resource extraction could be reflected in the level of conservation of the ecosystems. However, to ascertain any of these relations, a different study on the economic characteristics of each region and their relation with proximity to the services offered by large populations is necessary. The CPR of the agrarian centers that experienced greater precipitation were better conserved than areas where the annual average was lower. While field data to explain this do not exist, possibly, the greater availability of rain facilitates the recovery of vegetation lost in the CPR during the extractive activities being carried out in the agrarian centers. This, coupled with better institutional organization and greater availability for the care of natural resources in these agrarian centers, could favor the presence of a better-preserved CPR. Agrawal (2007) has suggested that the biophysical characteristics of managed systems are an important factor in achieving a successful collective management; however, this has been poorly studied. The organizational capacity of communities was an important feature related to the conservation of CPR and the ability to continue conservation programs. Communal organization in Mexico has been strongly rooted since pre-Hispanic times, which affects the particular characteristics of conservation policies in the country. To understand these characteristics, interaction with the local community organizations, which are commonly represented by the agrarian center authority and the members of an assembly, is necessary. However, the relation between a communal organization and conservation policy is not always successful because each institutional level operates under different objectives and standards. On the one hand, governmental institutions try to create a legal framework that applies to the entire country without taking into account the social differences and idiosyncrasies of each place, while on the other hand, local institutions generate rules for the management of the conditions of the place and sometimes perceive environmental policies as an imposition (Johnson and Nelson 2004). Accordingly, we propose that an evaluation of the relationship that exists between local institutions and the state is essential to seek alternative designs for conservation policies and the efficient use of public funds. This is even more important now that communities organized in agrarian centers in Mexico have been found to protect more than 50% of the primary and secondary vegetation in the country and that a good percentage of this occurs in Natural Protected Areas. Our results indicate that heterogeneity in the biophysical, socioeconomic and cultural context in which the agrarian centers exist indicates different capacities in terms of the conservation and maintenance of the natural areas. On the one hand, it is essential to recognize these differences and to include them in the design of programs that offer different projects according to the capabilities of the communities. On the other hand, it is necessary that governmental conservation programs be consistent with the goal of designing projects that achieve conservation of the environment in the long term. To serve a region that is both degraded and marginalized, the creation of a synergy between efforts to combat poverty and conservation programs is necessary. Trying to conserve a site that has material deprivations without considering a poverty-reduction program will definitely lead to conservation failure. Finally, we consider it necessary for the government to recognize the importance of maintaining payment for conservation work or rehabilitation of natural areas with public funds because these places generate environmental services that are generally public and benefit not only local residents but also an entire region (Bray et al. 2003; Figueroa and Sánchez-Cordero 2008). In this context, compensating the owners of the land where conservation activities are performed should be a national priority. We appreciate the logistical and financial support provided by the National Institute of Ecology and Climate Change (Instituto Nacional de Ecología y Cambio Climático - INECC) for conducting this study. We would like to thank T.T. Arteaga-Reyes, B. Maldonado-Almanza, F. Manzo and K. Ruiz-Bedolla for their help in the implementation of the questionnaires. We thank the communities who participated in the interviews and shared the information that we analyzed in this article. Finally, we would like to thank V. Evangelista-Oliva for the map used in Figure 1 and J. Blancas-Vázquez for his valuable comments on the manuscript that served to improve the final version. Agrawal, A (1994). Rules, Rule Making, and Rule Breaking: Examining the Fit Between Rule Systems and Resource Use In: Rules,Games, and Common Pool Resources. Ostrom, E, Gardner, R and Walker, J eds. : 267–282. Michigan: The University of Michigan Press. Agrawal, A (2007). Forests, Governance, and Sustainability: Common Property Theory and Its Contributions. International Journal of the Commons 1(1): 111–136. https://doi.org/10.18352/ijc.10. Agrawal, A and Gibson, C. C (1999). Enchantment and Disenchantment: The Role of Community in Natural Resource Conservation. World Development 27(4): 629–649. https://doi.org/10.1016/S0305-750X(98)00161-2. Agrawal, A and Yadama, G (1997). How Do Local Institutions Mediate Market and Population Pressures on Resources? Forest Panchayats in Kumaon, India. Development and Change 28(3): 435–465. https://doi.org/10.1111/1467-7660.00050. Arriagada, I, Miranda, F and Pávez, T (2004). Lineamientos de Acción Para El Diseño de Programas de Superación de La Pobreza Desde El Enfoque Del Capital Social. Serie Manuales CEPAL.Vol. 36Manuales. Santiago de Chile: Naciones Unidas - CEPAL. Boege, E (2008). El Patrimonio Biocultural de Los Pueblos Indígenas de México. D.F: Instituto Nacional de Antropología e Historia. Bray, D. B, Merino-Pérez, L, Negreros-Castillo, P, Torres-Rojo, J. M and Vester, H. F. M (2003). Mexico’s Model Forests as a Global Community-Managed for Sustainable Landscapes. Conservation Biology 17(3): 672–677. https://doi.org/10.1046/j.1523-1739.2003.01639.x. Bray, D. B, Antinori, C and Torres-Rojo, J. M (2006). The Mexican Model of Community Forest Management: The Role of Agrarian Policy, Forest Policy and Entrepreneurial Organization. Forest Policy and Economics 8(4): 470–484. https://doi.org/10.1016/j.forpol.2005.08.002. Butler, C (2003). Creación de Incentivos Sociales Para La Conservación de La Biodiversidad. La Conservación Y El Desarrollo Integrado: Lecciones Aprendidas Al Vincular Pueblos, Proyectos Y Políticas En América Tropical. Rhoades, R and Stalling, J eds. Quito: Ediciones Abya-Yala, pp. 129–136. Clark, P. B and Wilson, J. Q (1961). Incentive Systems: A Theory of Organizations. Administration Science Quarterly 6(2): 219–266. https://doi.org/10.2307/ 2390752. Cleaver, F (2000). Moral Ecological Rationality, Institutions and the Management of Common Property Resources. Development and Change 31(2): 361–383. https://doi.org/10.1111/1467-7660.00158. CONANP. Comisión Nacional de Áreas Naturales Protegidas, http://www.conanp.gob.mx/que_hacemos/mapa.php. Cox, M, Arnold, G and Villamayor, S (2010). A Review of Design Principles for Community-Based Natural Resource Management. Ecology and Society 15(4): 28. https://doi.org/10.5751/ES-03704-150438. DOF. Ley Agraria. Título Tercero de Los Ejidos Y Comunidades. Capítulo I, Sección Tercera de Los Organos de Los Ejidos. Falk, T (2008). Communal Farmers’ Natural Resources Use and Biodiversity Preservation. A New Institutional Economic Analysis from Case Studies in Namibia and South Africa. Göttingen: Cuvillier Verlag. Figueroa, F and Sánchez-Cordero, V (2008). Effectiveness of Natural Protected Areas to Prevent Land Use and Land Cover Change in Mexico. Biodiversity and Conservation 17(13): 3223–3240. https://doi.org/10.1007/s10531-008-9423-3. Fraser, E. D. G (2004). Land Tenure and Agricultural Management: Soil Conservation on Rented and Owned Fields in Southwest British Columbia. Agriculture and Human Values 21: 73–79. https://doi.org/10.1023/B:AHUM.0000014020.96820.a1. Gibbs, C. J. N and Bromley, D. W (1989). Institutional Arrangements for Management of Rural Resources: Common-Property Regimes In: Common Property Resources: Ecology and Community-Based Sustainable Development. Berkes, F ed. London: Belhaven, pp. 22–32. Gonzalez de la Rocha, M (2005). Oportunidades Y Capital Social. Aprender de La Experiencia. El Capital Social En La Superación de La Pobreza. Arriagada, I ed. Santiago: Naciones Unidas - CEPAL, pp. 61–97. Gotelli, N. J and Ellinson, A. M (2013). A Primer of Ecological Statistics In: Journal of Chemical Information and Modeling. Vol. 53Massachusetts: Sinauer Associates, Inc.
Hayes, T. M (2006). Parks, People, and Forest Protection: An Institutional Assessment of the Effectiveness of Protected Areas. World Development 34(12): 2064–2075. https://doi.org/10.1016/j.worlddev.2006.03.002. Herreros-Vasquez, F (2003). Las Fuentes de La Confianza. Revista Internacional de Sociología 61(35): 151–175. https://doi.org/10.3989/ris.2003.i35.304. INEGI. Instituto Nacional de Estadística Geografía E Informática, http://www.inegi.org.mx/est/contenidos/proyectos/Agro/ca2007/Resultados_Ejidal/default.aspx. INEGI. Instituto Nacional de Estadística Geografía E Informática, http://www.inegi.org.mx/geo/contenidos/recnat/usosuelo/. Johnson, K. A and Nelson, K. C (2004). 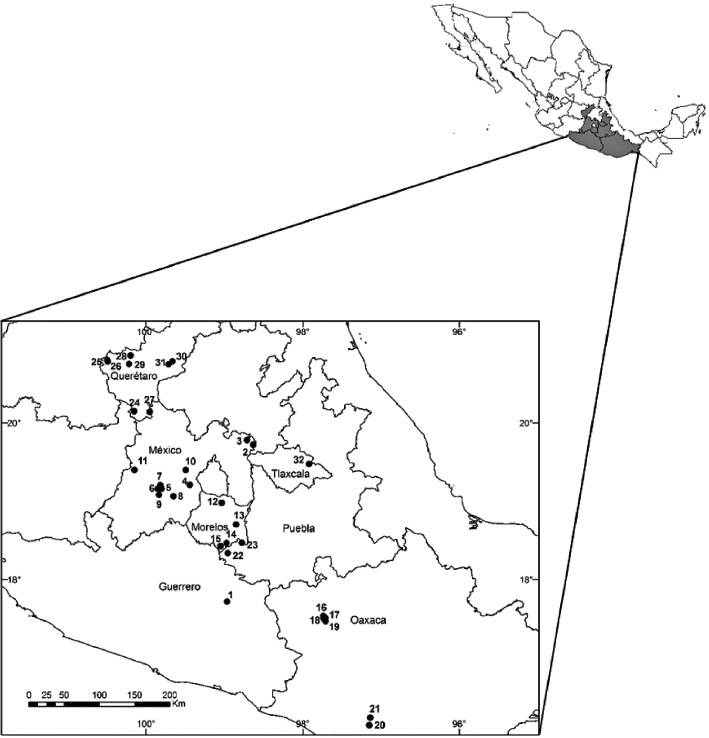 Common Property and Conservation: The Potential for Effective Communal Forest Management within a National Park in Mexico. Human Ecology 32(6): 703–733. Johnson, D. L, Ambrose, S. H, Bassett, T. J, Bowen, M. L, Crummey, D. E, Isaacson, J. S, Johnson, D. N, Lamb, P, Saul, M and Winter-Nelson, A. E (1997). Meanings of Environmental Terms. Journal of Environment Quality 26(3): 581. https://doi.org/10.2134/jeq1997.00472425002600030002x. Liu, J. H and Sibley, C. G (2006). Differential Effects of Societal Anchoring and Attitude Certainty in Determining Support or Opposition to (Bi) Cultural Diversity in New Zealand. Papers on Social Representations 15(March 2016): 1–15. McKean, M (2000). Common Property: What Is It, What Is It Good For, and What Makes It Work? In: People and Forests: Communities, Institutions and Governance. Gibson, C. C, McKean, M. A and Ostrom, E. eds. : 27–55. Cambridge, MA: MIT Press. Oldekop, J. A, Bebbington, A. J, Brockington, D and Preziosi, R. F (2010). Understanding the Lessons and Limitations of Conservation and Development. Conservation Biology 24(2): 461–469. https://doi.org/10.1111/j.1523-1739.2010.01456.x. Olson, M (1965). The Logic of Collective Action. Public Goods and the Theory of Groups. Cambridge: Harvard University Press. Ortega-Argueta, A, González-Zamora, A and Contreras-Hernández, A (2016). A Framework and Indicators for Evaluating Policies for Conservation and Development: The Case of Wildlife Management Units in Mexico. Environmental Science & Policy 63: 91–100. https://doi.org/10.1016/j.envsci.2016.05.003. Ostrom, E (1992). The Rudiments of a Theory of the Origins, Survival, and Performance of Common-Property Institutions. Making the Commons Work: Theory, Practice and Policy. Bromley, D. W ed. San Francisco: ICS, pp. 293–318. Pérez, J. L, Villalobos, M, Rosete, F, Salinas, E, Remond, R and Salas, E (2011). Mapa Digital Del Cambio Del Uso Del Suelo Y de La Vegetación En México, 1976–2008, Escala 1:250000.. Instituto Nacional de Ecología Y Cambio Climático, México: http://www2.inecc.gob.mx/emapas/index.html. Portes, A (1998). Capital Social: Sus Orígenes Y Aplicaciones En La Sociología Moderna. De Igual a Igual: El Desafío Del Estado Ante Los Nuevos Problemas Sociales. Carpio, J and Nouacous, I. eds. Ciudad de México: Fondo de Cultura Económica. Poteete, A. R and Ostrom, E (2008). Fifteen Years of Empirical Research on Collective Action in Natural Resource Management: Struggling to Build Large-N Databases Based on Qualitative Research. World Development 36(1): 176–195. https://doi.org/10.1016/j.worlddev.2007.02.012. Poteete, A. R, Janssen, M and Ostrom, E (2010). Working Together. Collective Action, the Commons, and Multiple Methods in Practice. New Jersey: Princeton University Press. Putnam, R. D (2001). Reviewed Work: Bowling Alone: The Collapse and Revival of American Community. Contemporary Sociology 30(3): 227–230. Reisman, D (1990). Theories of Collective Action: Downs, Olson and Hirsch. New York: St.Martin’s Press.. https://doi.org/10.1057/9780230389977. Ritchey, F (2008). Estadísiticas Para Las Ciencias Sociales. México: Mc Graw Hill/Interamericana de México. SEGOB. Índice de Marginación Por Localidad. Secretaria de Gobernación, http://www.conapo.gob.mx/es/CONAPO/Indice_de_Marginacion_por_Localidad_2010. Somanathan, E., Prabhakar, R. and Mehta, B. S. (2005). Does Decentralization Work ? Forest Conservation in the Himalayas 1. Bureau for Research and Economic Analysis of Development. Delhi: Indian Statistical Institute. Soule, M, Tegene, A and Wiebe, K. D (2000). Land Tenure and the Adoption of Conservation Practices. American Journal of Agricultural Economics 82(4): 993–1005. https://doi.org/10.1111/0002-9092.00097. Sprugel, D. G (1991). Disturbance, Equilibrium, and Environmental Variability: What Is ‘Natural’ Vegetation in a Changing Environment?. Biological Conservation 58(1): 1–18. https://doi.org/10.1016/0006-3207(91)90041-7. Vargas, M, Ochoa, F and Danemann, G (2008). Tenencia de La Tierra Y Conservación de Tierras Privadas. Bahia de Los Ángeles: Recursos Naturales Y Comunidad. Gámez, A ed. México: Instituto Nacional de Ecología, pp. 679–694. Wilson, J. Q (1995). Political Organization. New Jersey: Princeton University Press. Wunder, S (2000). Ecotourism and Economic Incentives—An Empirical Approach. Ecological Economics 32(3): 465–479. https://doi.org/10.1016/S0921-8009(99)00119-6. Wunder, S (2001). Poverty Alleviation and Tropical Forests-What Scope for Synergies?. World Development 29(11): 1817–1833. https://doi.org/10.1016/S0305-750X(01)00070-5. General characteristics of the agrarian centers where the interviews were conducted. Nineteen variables related to the physical, social, and economic characteristics used for discriminant analysis. The variables highlighted in bold were those statistically significant (see Tables 3 and 4).